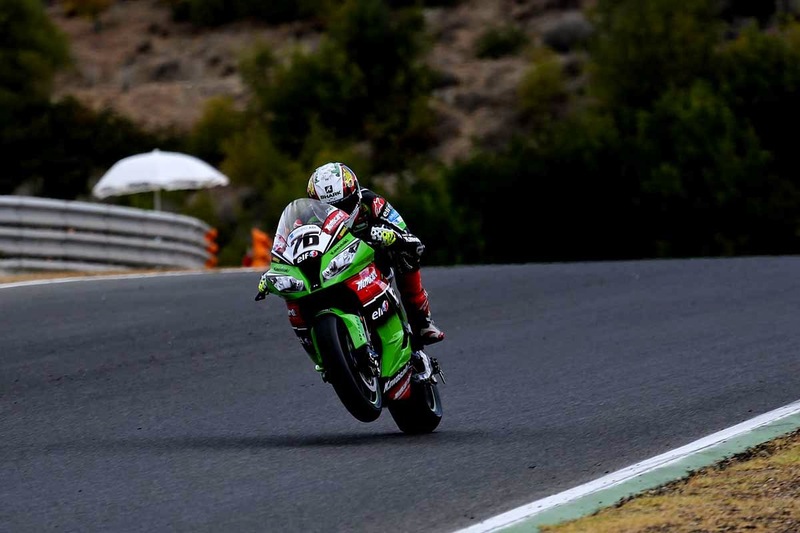 Loris Baz broke the World Superbike track record to claim his second pole position in the class at round ten in Jerez. Having topped Friday’s time sheets, Baz set about Saturday afternoon’s Superpole session like a man possessed, overcoming a strong Davide Giugliano challenge for his first pole position since Assen. The Frenchman’s final time of 1min 40.298secs was three tenths under Eugene Laverty’s Superbike track record and 0.2s faster than Giugliano’s Panigale. Indeed, the Italian was set for pole position with two minutes remaining before Baz’s late effort demoted him to second. Giugliano was typically on the limit, running off track at turn one after his fastest time was set. Baz’s pole was however in doubt up until the final seconds as Tom Sykes was on course for the fastest time through the first three sectors. Yet the reigning world champion’s lap went away from him somewhat and he was forced to settle for third place, 0.26s down on his team-mate. Marco Melandri headed both of Saturday’s free practice sessions but he could do no more than qualify fourth, 0.52s slower than pole. He was followed by Sylvain Guintoli (+0.579s) and Eugene Laverty (+0.79s), who is fairly confident with his race pace for tomorrow.